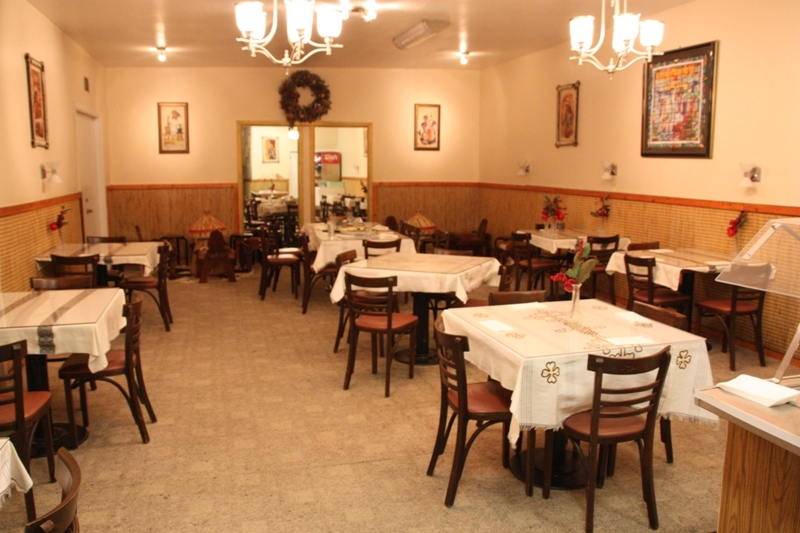 Still haven’t been to Ethiopian food yet? You’ve gotta do it. 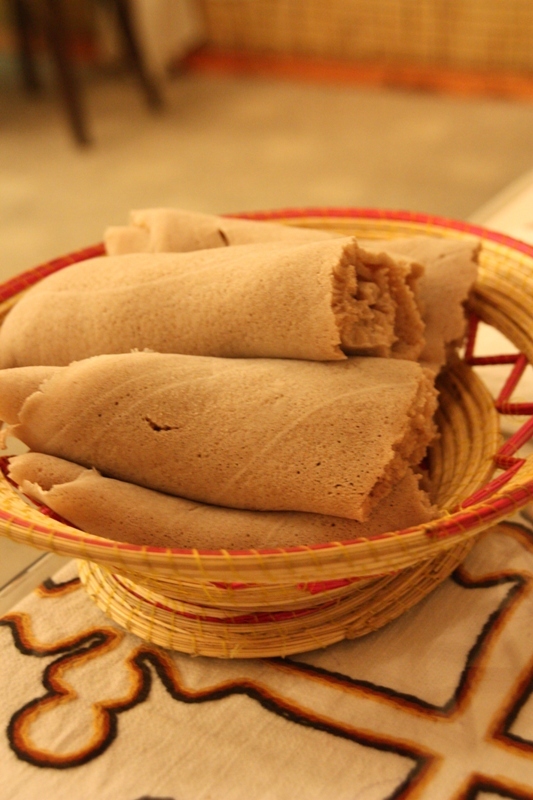 And even if you’ve previously enjoyed scooping up the soupy goodness with your injera, Cafe Rehoboth is highly recommended as a new place to try. 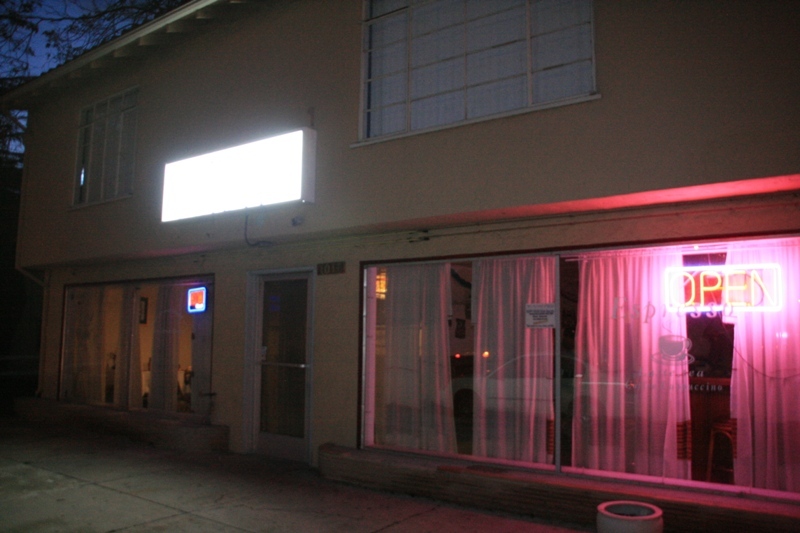 Located just near Japan Town in San Jose, Cafe Rehoboth, though mildly unpronounceable, is a great place for Ethiopian fare. 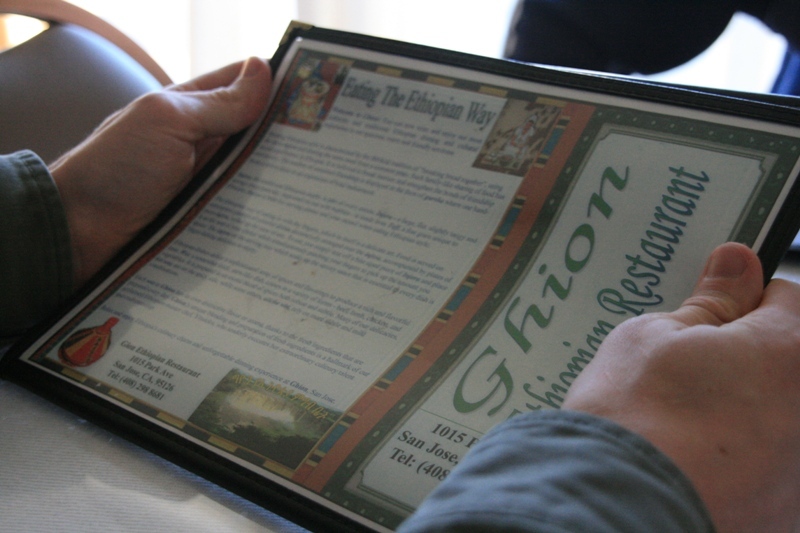 We’ve become somewhat of Ethiopian connoisseurs over the past few years and find that Rehoboth fits the bill for standard atmosphere and service in an Ethiopian restaurant, while perhaps exceeding expectations in terms of menu layout and choices. 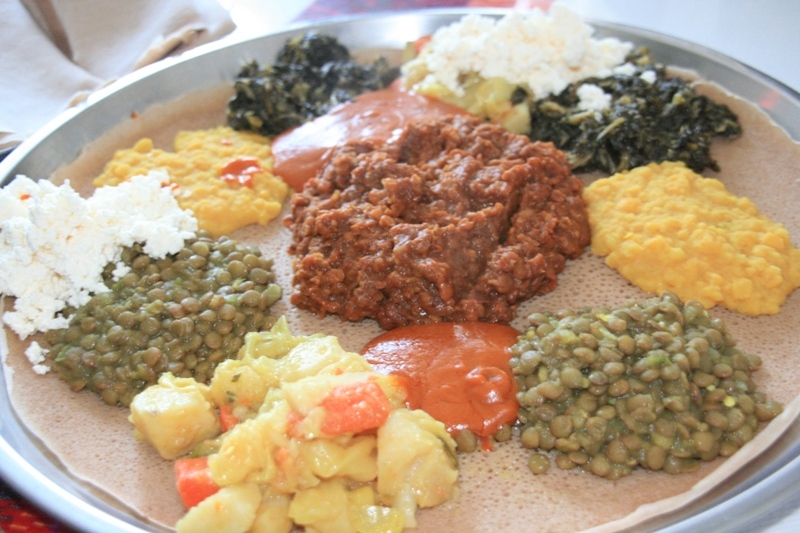 Ethiopian restaurants are to be judged on a different scale than other restaurants. There seems to be something about them that just does not add up to any “normal” restaurant we’re used to. I won’t harp on the differences, since I’ve done so before, but let’s just summarize and say that the decor is often stark, the seating is often empty, and there is often no music playing in the background. This can sometimes be awkward: sitting in a silent, empty room, munching on your slop. Once you know what to expect, however, you can focus on the food rather than the oddities of the atmosphere. Cafe Rehoboth had the same general lack of customers and background music upon our arrival, but that may have been because we arrived late on a Wednesday evening. The atmosphere was actually quite nice compared to some of the other places we’ve been to. 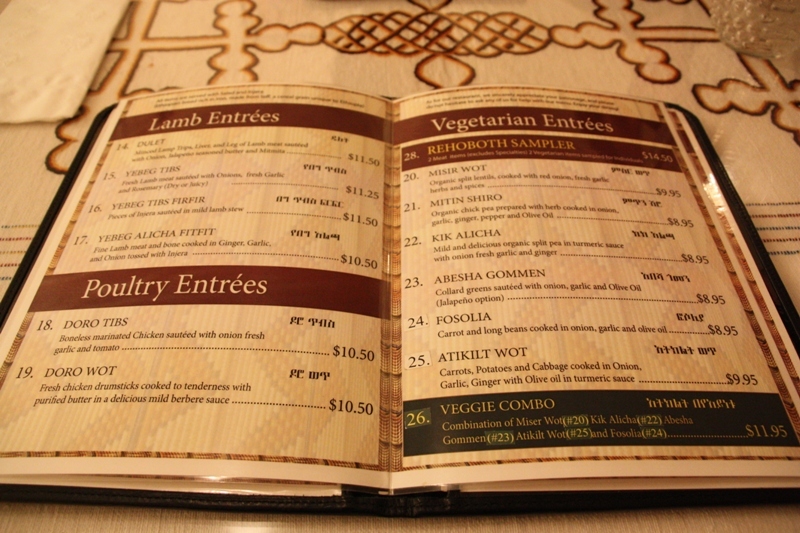 The menu here was pro—it looked professionally designed and printed, and was clear and extensive. This is sometimes hard to find at Ethiopian restaurants that we’ve frequented in the past. We were hence able to decide our culinary fate with ease. I hate to say it, but I have literally found almost no need for other items on Ethiopian menus than sampler plates. Samplers allow you to experience a variety of the foods offered without committing to any one dish. It’s the best idea ever and every Ethiopian restaurant seems to be on board with it. Only glancing over the menu, our table of 7 ordered veggie combos for 5 of us and meat combos for the other 2. 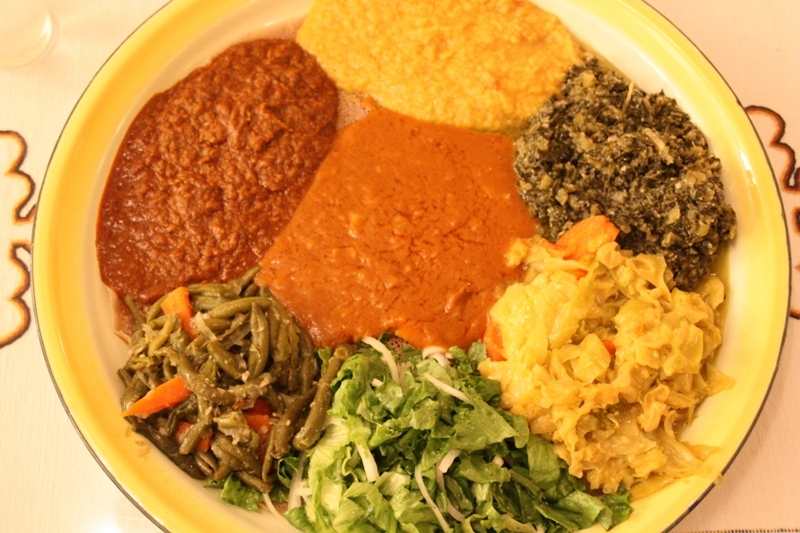 When you order a combo plate (or any dishes) at an Ethiopian restaurant you will undoubtedly receive your meal(s) on one gigantic plate to be shared among up to 4 people. Again, if you expect this, it’s kinda fun. Our meals arrived after a bit of a wait (I gave them a break about this—we did order one of everything on the menu in the combos) and were delicious. Instead of attempting to describe the different flavors of goo in uneducated jargon, perhaps the following pictures of our food can speak instead. The food was well received by all and the staff was kind and friendly as usual (Ethiopian folks seem to be very nice people, at least the ones that staff restaurants in other countries). 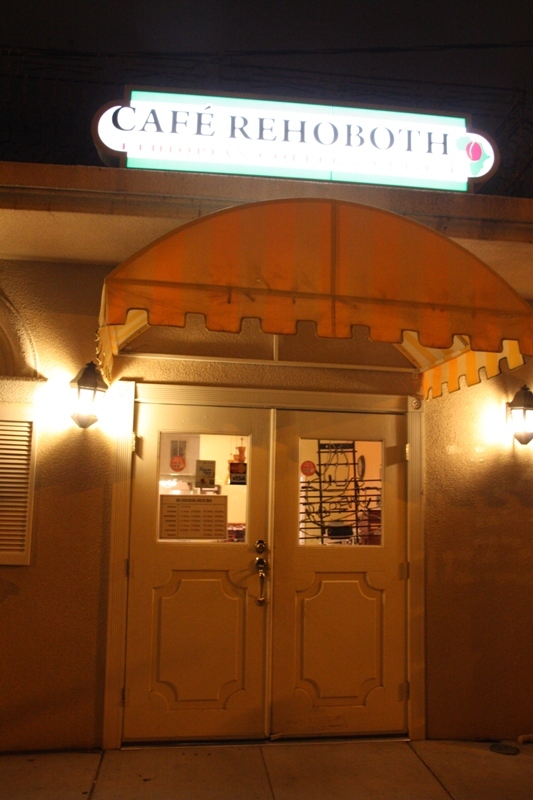 I not only enjoyed Cafe Rehoboth, I’d happily return for more anytime we’re in San Jose. Ok, how many pizza shops are called New York Pizza? Seriously, it took me 5 minutes to find this one on Google because even typing “New York Pizza San Jose” into the search comes up with more hits than and oldies radio station. I realize that many restaurants sell New York style pizza. Use. A. Different. Name. I suppose I should apologize to A Slice of NY Pizza for that rant, they deserved it no more than the hordes of other pizza places of the same name. One of which, mind you, I’ve already reviewed. But these two are not related, thankfully, despite a flash of panic when we arrived to pick up this latest pie. Two of our friends who live in San Jose recommended (read: demanded) that we try this pizza place. And unlike all the other “New York Pizza”s out there, this one is actually called A Slice of New York Pizza, though the distinguishing forewords are in such tiny print on their sign that no one but the hummingbirds are aware of it*…. Yes, Ethiopian food. I think I made the same jokes before I tried it too. 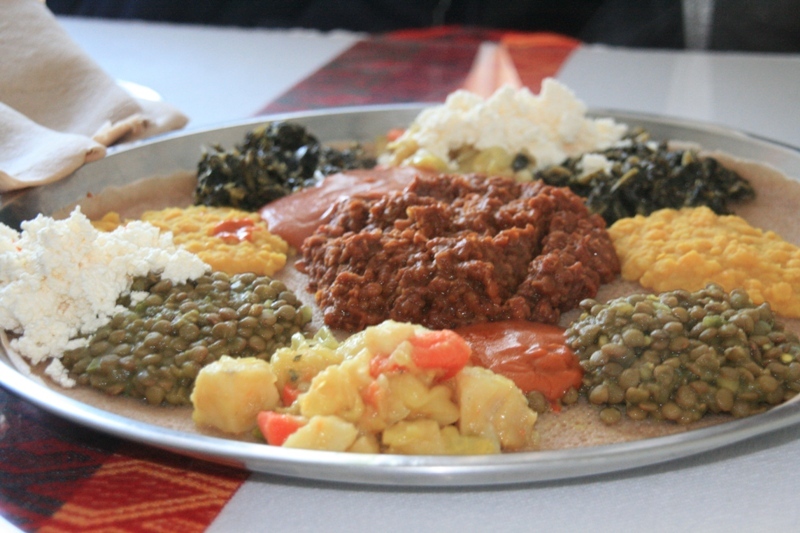 Many people haven’t had Ethiopian food, and to them I often describe it as plops of mushy stuff with spices, sort of like Indian food, served on a giant flat pancake shaped piece of sourdough spongy bread. Oh and by the way, you tear off pieces of the bread and scoop up the food with it to eat. No forks. So fun. If you’ve never tried Ethiopian and you’re not a food prude, I’d highly recommend it. It’s one of my favorites and was a weekly endeavor when we lived in Australia. The food is delicious, the way you eat it is fun, and the whole thing is a different experience for us westerners. 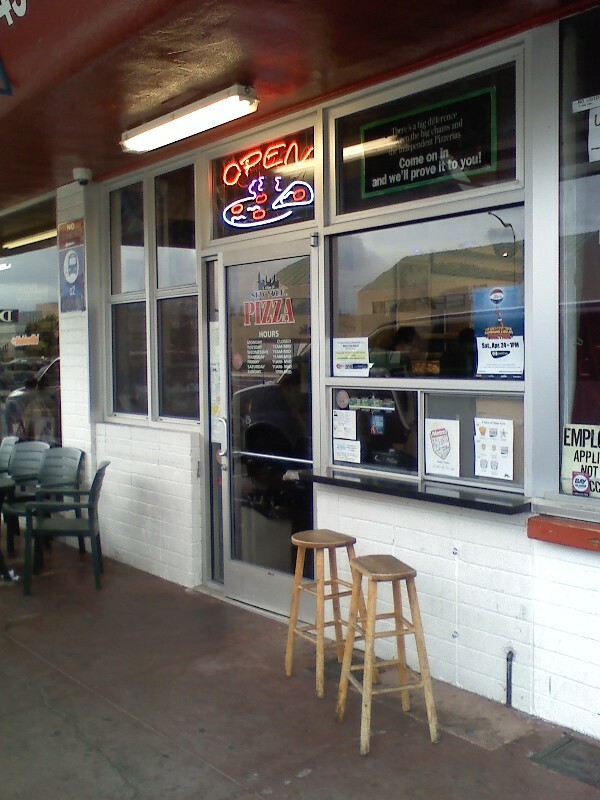 The exterior of Ghion may be a bit forbidding, but don’t let it stop you from going in! I’ve been eating Ethiopian food only for about the last two years, and have in that time tried probably a dozen different places (mostly in Melbourne, Australia). In my experience, most Ethiopian restaurants are the same in a very odd way. And because Ghion fit the bill, I was both amused and impressed. 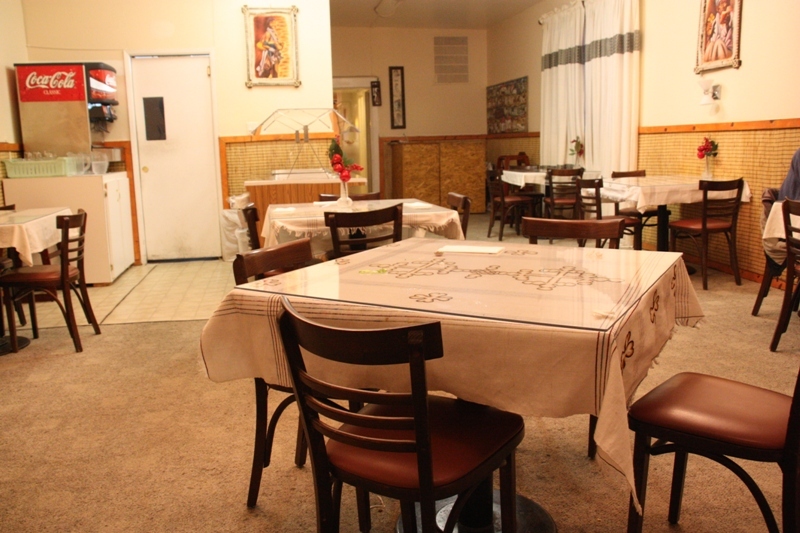 The very best Ethiopian places are dead empty when you arrive. 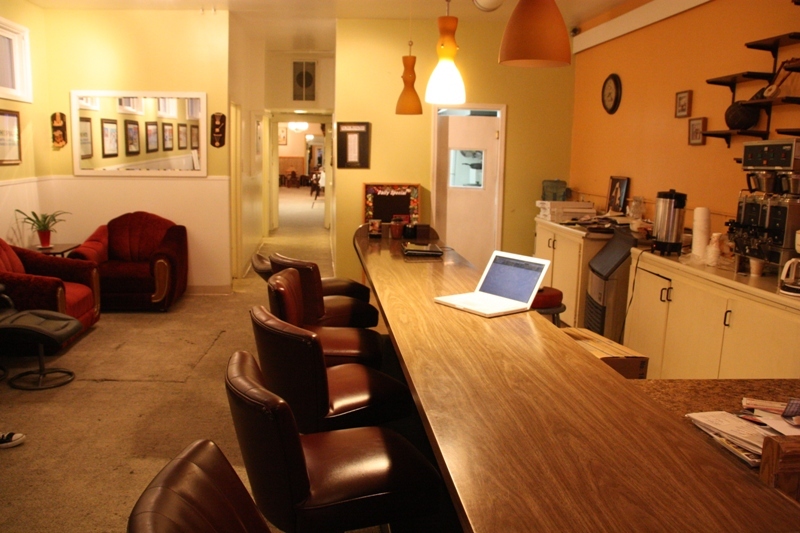 There is often no music playing, and no one in the facility, possibly not even a waiter. There may be a group of Ethiopian gentlemen speaking (assumingly) Ethiopian and not paying you a bit of mind. The dining area may be scantily decorated with an appropriately African theme. 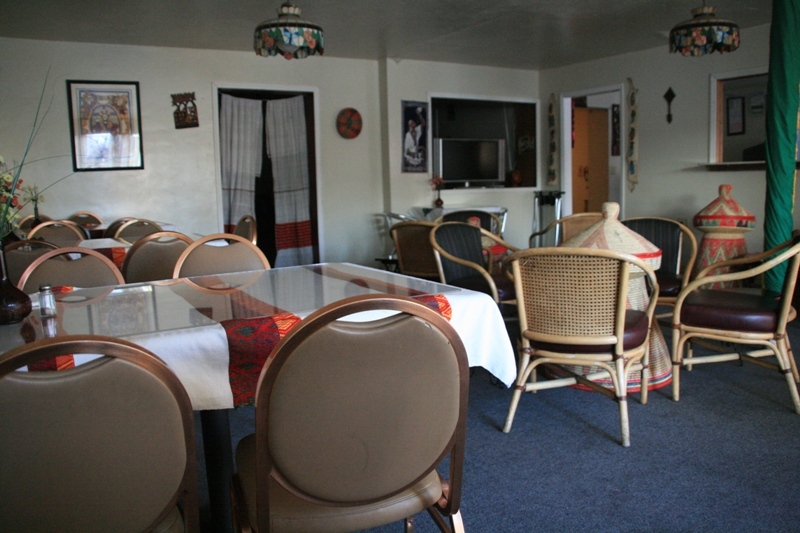 The seating area in Ghion restaurant. When you receive the menus, it is likely that pages are missing from most of them. I could hardly believe that we found yet another Ethiopian place where this is the case, but we did. It’s ok though, you can assemble the information between the few of you who have arrived together to assist in understanding the full menu selection. The waiter/owner/cook is friendly but has a heavy accent. Sometimes there are language communication difficulties, but he is polite and courteous so it’s not uncomfortable. It doesn’t really matter anyway, because whatever comes out of the kitchen will be good; no matter if you ordered it or not. Your only concern is to make sure you receive vegetarian food if you ordered that, and that part of the order never seems to get lost. Our food plate at Ghion. Up until this point, I have been describing Ghion and many other places I’ve been. I should now discuss the food at Ghion, which was excellent. The vegetarian combo we ordered (x2 to feed four people) was a standard combo that we’ve seen elsewhere also. The brown lintel mush, the yellow cabbage and potato pile, the green lintel stuff, the stuff that appeared to be spinach but may have been another green, and the yellow goo that I’m not sure what it was. De-lic-ious, even though I’m clearly not aware of the technical names or ingredients. We also ordered an appetizer of some sort of cheese, which was also placed on the big plate (white, crumbly), and boyfriend’s favorite dish of tomato-soup-consistency goo that was really, really good. 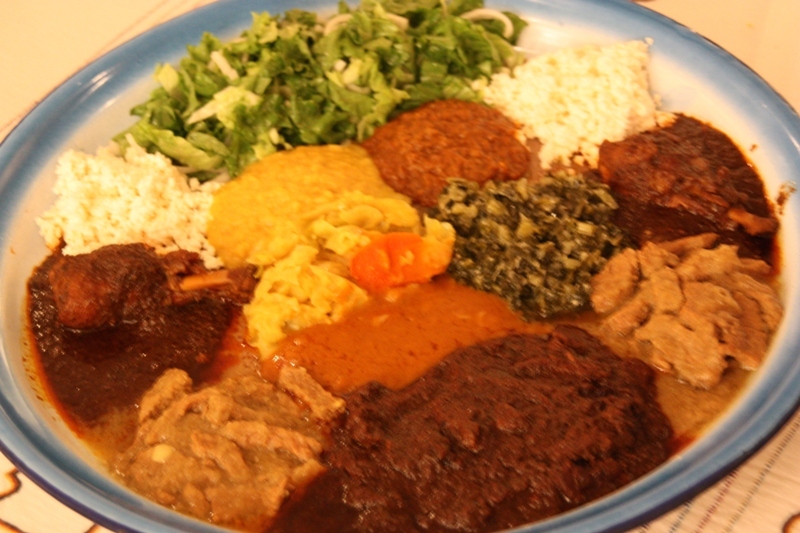 All of this with a generous side of wheat injera to scoop it with, and we were stuffed in no time. One of the other great things about Ethiopian food is that it’s typically pretty cheap. $42 covered all four of us including two beers, and we were certainly full to the brim. 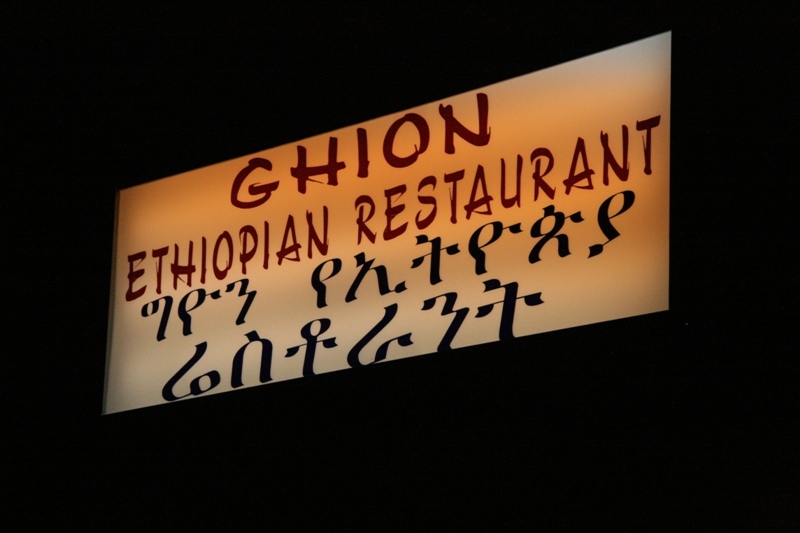 If you like Ethiopian, head down to Ghion to get your next fix, or, if you’ve never tried it, I’d say Ghion wouldn’t be a bad place to start. Note: Wait a minute, Angie, aren’t you in Japan right now? 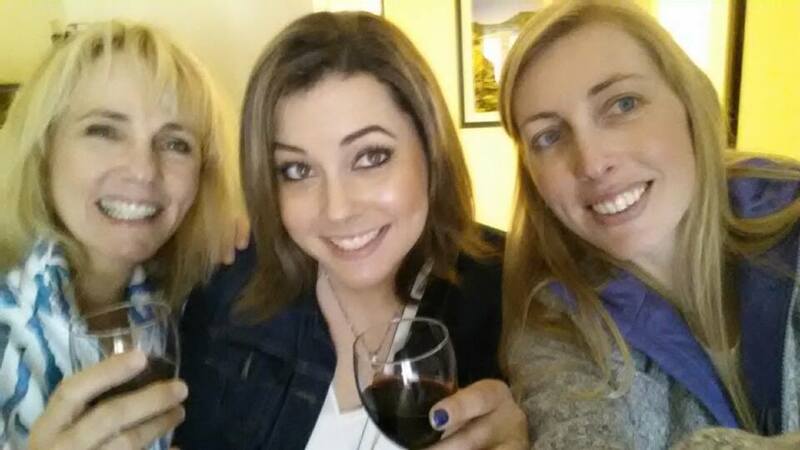 How are you patronizing restaurants in the Bay when you’re far far away? Touche, fair reader, good catch. I did not come to Japan fully unprepared – I have a few drafts waiting in the wings of this blog so as not to drop the ball while I’m away! Haha! Would I starve you of food posts while I travel the globe? Surely not. Keep your eyes peeled, I will be posting again!